ALT Perspective Brand Consultants. Web Design by Bazil. 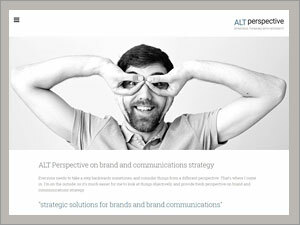 ALT Perspective aim to deliver tailor-made recommendations on the best strategic solutions for brands and brand communications, based on existing brand strengths and on the reality of their relationship with consumers in everyday life. It's much easier for us to look at things objectively, and provide fresh perspective on brand and communications strategy. Responsive site designed, maintained and hosted by Web Design by Bazil.